The Russian space agency Roscosmos launched a military satellite on Oct. 25, 2018, in the agency's first liftoff since a crew launch failed. The Russian space agency Roscosmos has successfully launched its first rocket since a dramatic crewed Soyuz launch abort on Oct. 11 to the International Space Station. 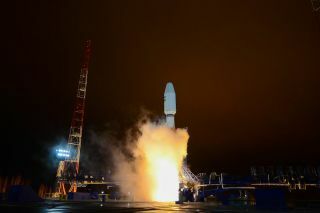 The launch took place at 3:15 a.m. local time on Oct. 25 (8:15 p.m. EDT on Oct. 24; 0015 a.m. GMT on Oct. 25) from Plesetsk Cosmodrome, which is located about 500 miles (800 kilometers) north of Moscow and has been used for satellite launches since 2004. Yesterday's launch lifted a Russian defense satellite now known as Cosmos-2528, according to a Roscosmos statement following the launch, although Roscosmos has not provided any information about what the satellite will be doing now that it is in orbit. Cosmos-2528 was blasted off Earth by a Soyuz-2.1b rocket, a cargo-only medium-class launch vehicle in Roscosmos' Soyuz family of launchers. Roscosmos announced on Oct. 17 that it would require three successful robotic launches on Soyuz vehicles before returning to crewed flights, but at the time yesterday's launch had not been publicly announced. There are still five additional Soyuz launches scheduled before the next planned crew launch in December. Email Meghan Bartels at mbartels@space.com or follow her @meghanbartels. Follow us @Spacedotcom and Facebook. Original article on Space.com.